In this first episode of 2016, Robert and I discuss three articles that dig into the increasingly murky area of native advertising. Only one thing is clear: Consumers can’t tell the difference between editorial and sponsored content. Ad blocking and podcasting dominated the key trends of 2015, and we explain why publishers must reduce “content friction” to keep their audiences happy. Next, we explore how podcasting is taking a lead role in innovating advertising, and the opportunities this is likely to create. Finally, we disagree with Jason Calacanis’ prediction that Snapchat is going to be the next big thing. Rants and raves include a clear definition of content marketing, the misguided ravings of “digital dissenters” and a podcast that explains why you shouldn’t build your content house on rented land. We wrap up the show with a #ThisOldMarketing example of the week from Pennsylvania Rural Electric Cooperative. Consumers can’t tell native ads from editorial content (6:34): Consumers have difficulty distinguishing between native advertising and editorial content, according to a new study by researchers at Grady College in Georgia. In a related story, The Interactive Advertising Bureau last week expressed mixed feelings about the Federal Trade Commission’s new guidelines for native advertising. Finally, the U.K.’s Advertising Standards Authority slammed The Telegraph for not making it clear that an article and video on its website were paid for by Michelin. Robert and I agree that consumers don’t have a clue which content is sponsored, even if it says “sponsored by” or “presented by.” We suggest the stance the IAB ought to take to provide clear guidance for publishers and advertisers, as well as greater clarity for consumers. 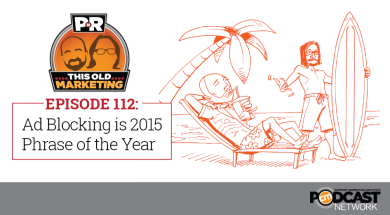 Podcasts: Where people choose to listen to ads (24:28): Podcasts are transforming advertising. They’ve become pioneers in creating a different commercial model where audiences are choosing to not skip the ads, but in some cases rewind to hear them again, says Corey Layton in this article from mUmBRELLA. He says a growing number of podcasters have found a way to create commercials that are just as entertaining as the content that surrounds them. Robert and I agree that the opportunities are huge for commercial messages to be more tightly – and creatively – integrated into podcasts. Snapchat is going to reach a billion users thanks to Generation S – the smartphone generation (31:16): Snapchat is going to reach a billion users, challenging Facebook, YouTube, and mainstream media, for the attention of “Gen-S” — the smartphone generation – predicts Jason Calacanis. What’s driving his thinking on this prediction? DJ Khaled, who has built a huge following not only promoting the products he uses, but providing his followers with tips on how to be as successful as he is. Robert questions if Khaled will be successful beyond Snapchat, which he views as a fad. I disagree. 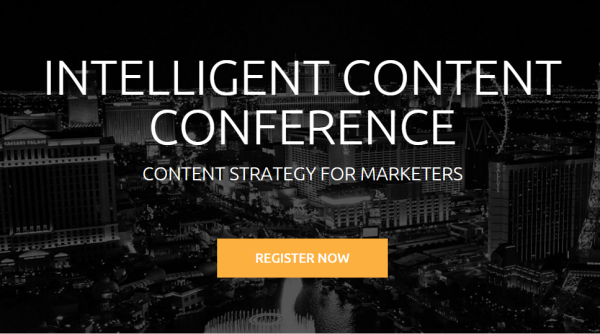 Intelligent Content Conference 2016: Are you serious about content marketing? Then this is your event. ICC 2016, March 7-9 in Las Vegas, is the one content strategy event specifically designed for marketing practitioners. In order for you to be truly effective at your content marketing, you need to scale your content, leverage the right technology, easily repurpose and reuse content, and deliver content to the right person, at the right time, regardless of device. That’s what ICC is all about. Learn more and register at http://IntelligentContentConference.com. Use the code PNR for $100 off when registering. Robert’s raves and rant: Robert has two raves and a rant this week. The first rave is for Jay Acunzo’s awesome article that defines content marketing in a simple and fun format that features the Jargon Monster and the Naked Little Truth. The second rave is for an excellent article from Ad Age entitled A CMO’s Guide for Marketing Transformation. It’s a wonderful checklist for approaching digital marketing as a CMO or marketing leader. Finally, he rants about a Washington Post article that profiles “digital dissenters,” who sense that human needs are getting lost in the tech frenzy. Robert doesn’t take issue with the article itself, but with the “team human” supporters who seem to be making much ado about nothing, in his opinion. Joe’s rave: I’m intrigued by Michael Stelzner’s recent podcast with Mark Schaefer and Mitch Joel, in which they discuss why you shouldn’t build your content home on rented land. Within this 40-minute session, I heard statements I totally agreed with, but also ideas that I vehemently opposed. My favorite idea from Joel: To be successful, we must adopt an integrated network strategy that has three main elements, which I outline in the podcast. Pennsylvania Rural Electric Cooperative: In the 1930s, private power companies in the U.S. found it unprofitable to extend their electric power networks into rural areas. To address this challenge, rural communities formed cooperatives to build the infrastructure needed to transmit power to their communities. The Pennsylvania Rural Electric Cooperative (PREC) is one of those organizations. Today, PREC provides electricity to several hundred thousand households and businesses in rural Pennsylvania. The cooperative recently celebrated the 50th anniversary of its monthly PENN Lines magazine, which is focused on life in rural Pennsylvania, including social, political, economic, community development, health and education issues. It also contains content that informs consumers about better and more efficient uses of electricity. Today, PENN Lines has over 166,000 subscribers, which represents a large percentage of its customers. The magazine is entirely paid for via ads and sponsorships. It’s an awesome example of an organization using a content vehicle to deliver a better experience to its constituents – and a great example of #ThisOldMarketing.